An airship returns to its squadron. Unaware of the looming danger, a young man dreams of his future. He is a talented inventor who has perfected an astonishing flying machine, which he is about to try out. Suddenly, an invincible and inaccessible army of airships attacks with bombs and homing missiles. “The Airship Destroyer” is playing on the ever-recurring fear of invasion and eerily anticipates the air raids of WWI. The creativity of the special effects turns this short film into a real gem of science fiction cinema. Six years after being first shown, it is projected again in 1915. At that time, the terror of zeppelin air raids hangs over England. Several bombings claim very many lives in Yarmouth and King’s Lynn. London is also aimed at. It is only in 1917 that the creation of anti-airship incendiary bullets and of a special regiment in the Royal Air Force contains the deadly raids. 1 500 British subjects are victims of this modern war instrument foreshadowed in this film. 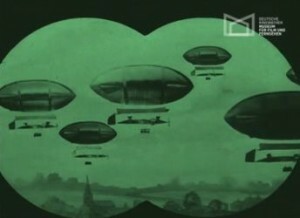 The airships are made using special effects. The animation and the models are the work of a master: the underestimated Walter R. Booth. Before even contributing to the early stages of cinema, Booth exercises his creativity and exuberant imagination as an amateur magician. From 1889 on, he produces films containing “tricks” that allow him to combine traditional drawing and animation techniques. His taste for science fiction feeds on numerous inspirations, particularly on the French Georges Méliès (1861–1938) and Jules Verne (1828–1905). In 1906, Booth joins the Charles Urban Trading Company. This production company favors films that cover news, travel, science and natural history. Its founder, Charles Urban, born in the United States to German emigrant parents, radically develops cinema in England. His company supports Booth who sets up his studio in his garden of Isleworth. However, after a few years, Booth gives up and takes on advertising. His work remains unfortunately ignored, as does the rest of his career. The original element is a dyed print on nitrate film base, which went from a private collection to the Deutsche Kinemathek in the sixties. It was reprinted at the Studio Cine laboratory using the Desmet color restoration system in 2003.